Good writing quality is one of the greatest assets for attorneys practicing before any court. While there is no universally accepted measure of good writing, software engineers are currently designing programs that measure writing quality in innovative and accurate ways. In past, Empirical SCOTUS has employed off-the-shelf metrics for writing quality to compare filings within a term. One of the exciting new tools to measure legal writing quality is BriefCatch. Designed by Ross Guberman, BriefCatch allows users to measure writing quality along five dimensions and get thousands of potential editing of suggestions. Guberman says that he created the scoring dimensions based on quantifiable features in the writing of such luminaries as Justices Roberts, Kagan, and Scalia. Making some of the edits that BriefCatch suggests generally makes the scores increase. For this post, I ran the petitions for certiorari and cert stage opposition briefs for granted cases during the 2017/2018 term through BriefCatch. This provided quantitative writing-quality data based on 136 filings. It also showed that both petitions and opposition briefs spanned the gamut of writing quality. Building on this point, not all of the granted petitions were well-written according to BriefCatch’s measurements. This post examines several sets of petitions and opposition briefs, highlighting the top scores across attorneys and firms. It uses all five of BriefCatch’s metrics, which include a Sentence Length Index that looks at median sentence length and variety in sentence length, a Flow Index that considers the breadth and depth of transitions and other guideposts, a Punchiness Index that rewards the use of short words and the avoidance of wordy phrases, a Plain English Index that discourages legalese and jargon other than terms of art, and a Reading Happiness Index that looks at all of the above plus other metrics. Each of these indices is determined on a 100-point scale, with 100 as the highest possible score. Most of the analyses in this post use the median of the five scores across each document. To begin, though, we can look at some of the indices in isolation. Judges often highly value Plain English, because overuse of legalese can detract from readers’ attention. 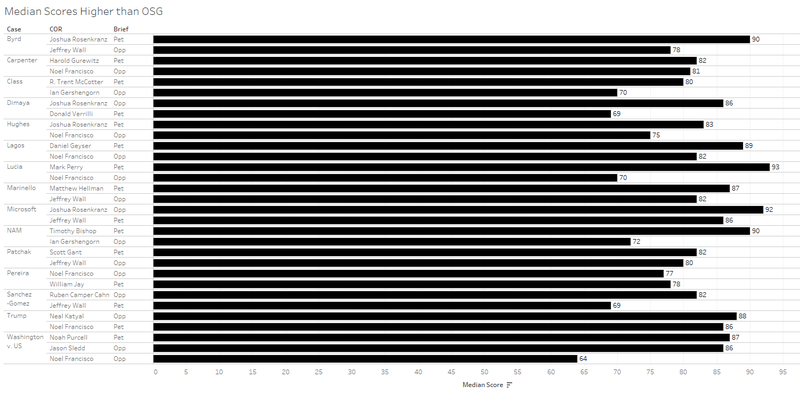 The first figure looks at the attorneys with the highest median Plain English scores for the term. For attorneys with multiple petitions and/or opposition briefs, the median Plain English score is used. Note that COR stands for counsel of record. Many of the attorneys with the top Plain English scores are not Supreme Court veterans. This may be comforting for attorneys at all levels as it might (for good reason) make the path to scoring high on the Plain English Index appear attainable. Of the top five Plain English scores, only one attorney, Matthew Fitzgerald, is in private practice (at McGuireWoods). The others include John Lawrence from the Louisiana District Attorney’s Office, Kristin Davidson and Ruben Cahn from the Federal Defenders, and the Solicitor General of the State of Washington – Noah Purcell. 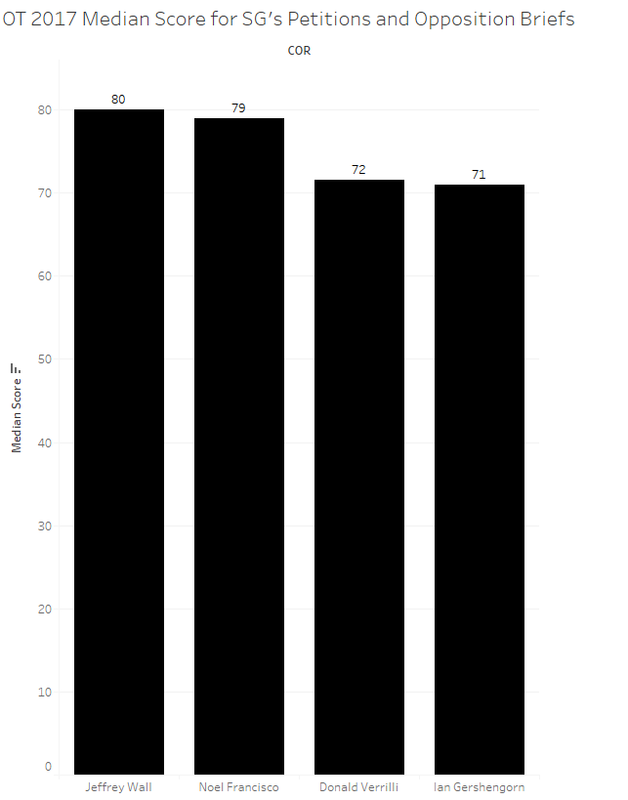 While some attorneys with strong Plain English scores also scored high on Reading Happiness, much of the ordering of attorneys differs on this measure. Matthew Fitzgerald, who scored second highest on Plain English, has the top score for Reading Happiness based on his cert petition in Collins v. Virginia. The other top scores in Reading Happiness came from private practice attorneys such as Gibson Dunn’s Mark Perry, Mayer Brown’s Paul Hughes, and Mololamken’s Jeffrey Lamken. Moving on to composite scores utilizing the five indices, the first such figure examines all petitions for certiorari in granted cases this term. Once again, Matthew Fitzgerald’s petition in Collins was the top scoring petition. Several veteran Supreme Court attorneys have top petitions this term, including Neal Katyal (the petition can be found here) and Paul Clement (here). Two attorneys – Jeffrey Fisher and Eric Murphy – have two top petitions each this term. Fisher’s top ranked petitions were in Currier v. Virginia and Jesner v. Arab Bank, while Murphy’s were in Ohio v. American Express and Husted v. A. Philip Randolph Institute. The group of attorneys behind the top opposition briefs were generally different from those who authored the top petitions. Jeffrey Lamken (found here) and Paul Hughes (found here) scored top marks in opposition along with Paul Clement (here), Loren AliKhan (here), and Dan Geyser (here). Several attorneys had multiple top opposition briefs including Supreme Court regulars Shay Dvoretzky and E. Joshua Rosenkranz, Virginia’s Solicitor General Stuart Raphael, as well as former SG Jeffrey Wall and current SG Noel Francisco. The high scores in the opposition category also provide evidence that extremely well-written opposition briefs will not necessarily persuade the Court to deny cert (just as well written petitions will not necessarily lead the justices to grant cert). To probe deeper in the SG’s performance in this term’s petitions and opposition briefs, the next figure looks at the median scores for the four Solicitors General who filed petitions and/or opposition briefs this term while in office. As petitions for cert this term were filed both while President Obama and while Trump were in office, both of the Presidents’ SGs had petitions and/or opposition briefs reviewed. Based on the sample of filings, the two SGs under Trump both wrote higher quality petitions and opposition briefs on average than the two SGs under Obama. 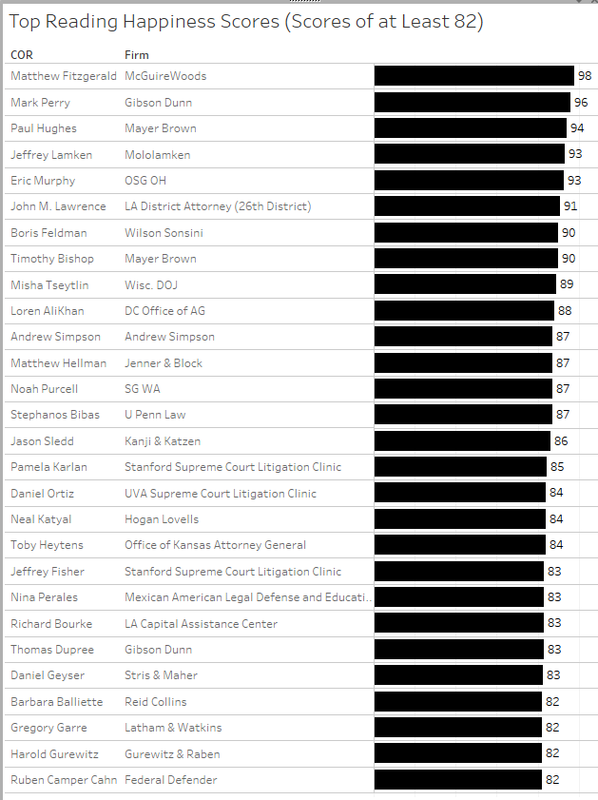 Jeffrey Wall just edges out Noel Francisco for the top SG median score for the term. Surprisingly, the OSG’s briefs, which are often touted as the best written filings the Court receives, were often not the most well written cert stage filings in a given case. The following figure shows all the instances this term in which the petition or opposition brief opposing the OSG’s position scored higher on BriefCatch than the OSG’s brief. Notably, in this figure Orrick’s Joshua Rosenkranz had petitions and/or opposition briefs that scored higher than the government’s in four different cases. Rosenkranz is the only non-OSG attorney captured in this figure more than once. It should be no surprise then that Rosenkranz was one of the top performing repeat players this term with more than one petition and/or opposition brief and a median score across filings of at least 80. Four attorneys had top median scores of 90 across multiple filings. These include Stris & Maher’s Daniel Geyser, Stanford’s Supreme Court Litigation Clinic’s Jeffrey Fisher, Jones Day’s Shay Dvoretzky, and Ohio’s SG Eric Murphy. 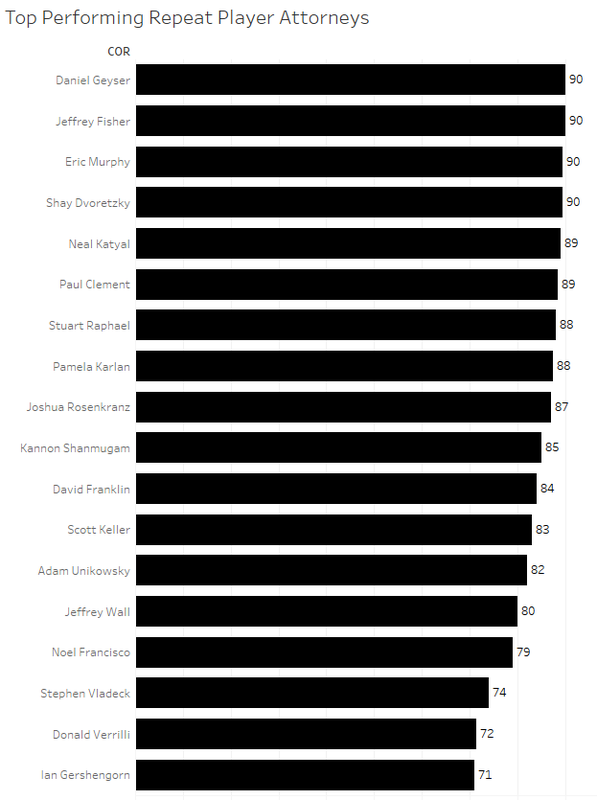 Other top scorers include former SGs Neal Katyal (Acting) and Paul Clement as well as Jeff Fisher’s colleague at Stanford’s Supreme Court Litigation Clinic, Pamela Karlan. The next figure looks at top performing repeat player law firms (or groups) this term. Two of the top scorers were the previously mentioned Ohio office of the Solicitor General and the firm Stris & Maher. 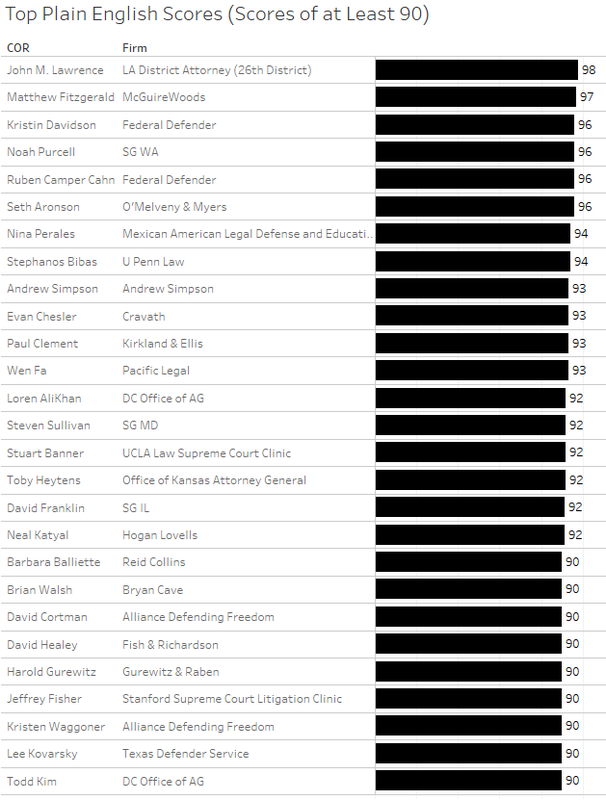 Also at the top of this list are Mayer Brown, the DC Office of the Attorney General, Hogan Lovells (where Neal Katyal works), Kirkland & Ellis (where Paul Clement works), and Stanford’s Supreme Court Litigation Clinic (where Jeffrey Fisher and Pamela Karlan work). While analyses like the one captured in the last figure point to the successes of Supreme Court veterans who are well versed in Supreme Court practice, many of the top petitions and opposition briefs in granted cases this term were filed by novice Supreme Court attorneys. This underscores how attorneys with rigorous legal writing training can write cogent legal briefs at any court level. With software like BriefCatch designed to solidify strong legal writing skills, we may soon see an upward trend in the average writing quality for Supreme Court filings. 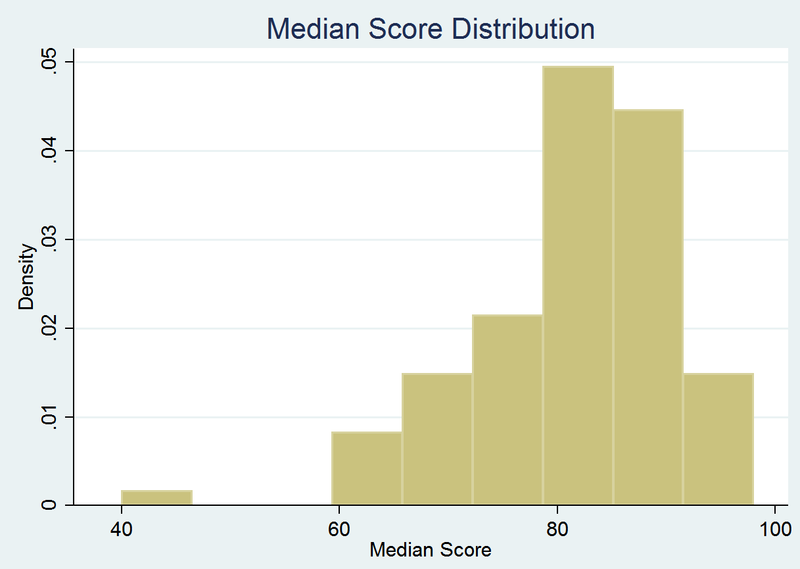 Update: In response to a request I have posted a histogram of the distribution of median scores for all attorneys covered in this post.